← Bye-Bye Leah and Jezebel??? This isn’t going to be a long post-promise. I just have a few things to share about Saturday’s book signing for Eve’s Sisters. Some of these things are nuggets of information that I learned and am tucking away for future signings (ever the optimist) and some are special memories. Let’s start with the gems of knowledge. It’s easier and more fun to do a signing with another person. It makes the event less stressful and more fun. You have another person around to take the pressure off of you, and you have someone to talk to in-between times when people are strolling around the store avoiding your little table stacked with books. Just make sure that the person with whom you’re signing is pleasant, amiable, and just as anxious for your success as you are for his or hers. I shared the event with Frank Mooneyhan and his wife, Kitty. I have a history with these two and was in the process of giving Kitty an iPhone tutorial when some bibliophiles began to saunter over to our table. I put the phone away and got into the business of the day. Truly eager for the other person’s success, Frank and I both told people that if they had to make a choice between his book and mine (or mine and his), to choose the other. Some people abided by that request, and some dear souls bought both. You know who you are. Thanks! I also learned that it’s considered proper to give the book store manager/owner a gift of appreciation for allowing you to hold a signing in her (in this case) place of business. I didn’t know that beforehand and am grateful to Brenda Remmes, a member of my writing group who attended the signing, for filling me in on this little tidbit. Now…what to get for Melody? Before I get to the most special memory of the day, there are a few other things worth mentioning. Although I already knew this, I was reminded of the importance of smiling. As a friend of mine used to say, “Even unfortunate looking people look better when they smile.” It’s true. It’s also true that even the most gorgeous people look less gorgeous with a frown or scowl. Also, the importance of believing in your own work, its value and worth, was reinforced on Saturday. How can you expect other people to recognize it if you don’t? And finally, if you want to sell something (anything), you have to do some work. You can’t just produce something and expect people to fall over themselves trying to get it, whether it’s a book or a piece or jewelry or some land off the coast of Florida. The best memory of the day was…drum roll, please. I was chatting with a friend when I looked up and saw this sweet, beautiful child standing perfectly still staring at me. I sort of sensed her presence before I actually saw her, and when I did, wow! I was beyond pleased. I was thrilled, ecstatic, overjoyed. 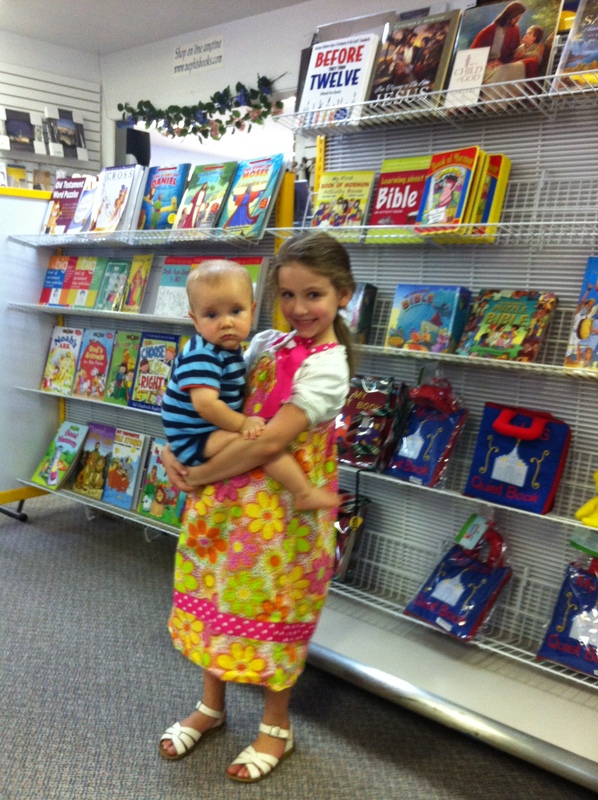 The little one was my 7- year-old granddaughter who was visiting the bookstore with a woman who had accompanied my daughter and her husband from Rincon, GA that morning. And it gets better. When I glanced to Brooke’s right, there was Seth, her baby brother. I had been feeling a little melancholy because not one family member was going to be there, and when I saw Brooke and Seth, my spirits began to soar. In case anyone is wondering about their parents, they were in the temple across the street. To conclude, I learned a lot of useful things on Saturday, things that will help me (and hopefully you too) in the future. Surround yourself with positive people, believe in your work, and work hard to get the word out about your event or work or grand opening. It’s also important to show appreciatation for those who help you out. And finally, having at least one person who shares your DNA show up can give you a boost like nothing else. This entry was posted in book signings, books, writers, writing life and tagged book signings, books. Bookmark the permalink. I enjoyed myself and was so happy to see Ruth Ann and Anita come by! And yes, your face lit up like a Christmas tree when you saw the granddarlings!